As I saw the cover for this short story I couldn’t help but wonder what sort of process the author followed when writing the series. Another thing that came to mind was – As an author, which she finds more rewarding writing gay romance or straight romance? 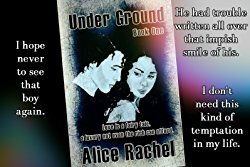 Alice Rachel answers my question below – enjoy it. My entire series revolves around forbidden romance. My straight couples usually aren’t allowed to be together because they are promised to someone other than the one they love. My gay couples aren’t allowed to be together because being gay is illegal in that world. So whether straight or gay, my couples face many obstacles, and I am able to send messages through my books no matter the orientation of the couple in that specific story. In general, I feel rewarded based on which character I am writing about rather than what kind of romance it is. I love all the couples in the series, but I have two favorite ships, one of which is straight (Stephen and Willow) and the other gay (Terrence and Chase). What’s interesting about these two couples is that they revolve around the same dynamics: me creating a sweet and pure character (Willow or Terrence) to help a character who is broken (Stephen or Chase). As a reader, I also love both gay romance and straight romance. However, I am against using people’s orientation as a way to make sales. One should write diverse characters because the world is diverse, not because diverse characters are suddenly popular to have in novels. A person’s orientation is a reality; it’s not some new trend to be used for money. It’s important to make the distinction between representing LGBT people fairly vs using them for personal gain. While I fully support the first concept, I will always condemn the second. Authors have a responsibility to do research and represent people well because harmful stereotypes can hurt marginalized people in ways we cannot perceive. It is our job to destroy those stereotypes, and that can only be done through serious research, it cannot be done if the ultimate goal is popularity and money. Therefore, the orientation of my characters doesn’t matter to me, and I enjoy writing both gay romance and straight romance equally. Writing Terrence’s story involved a lot more research than my straight romance though, and my series has been a real gift to me because my research has taught me so much. Thank you for having me on your blog and for being part of the tour.